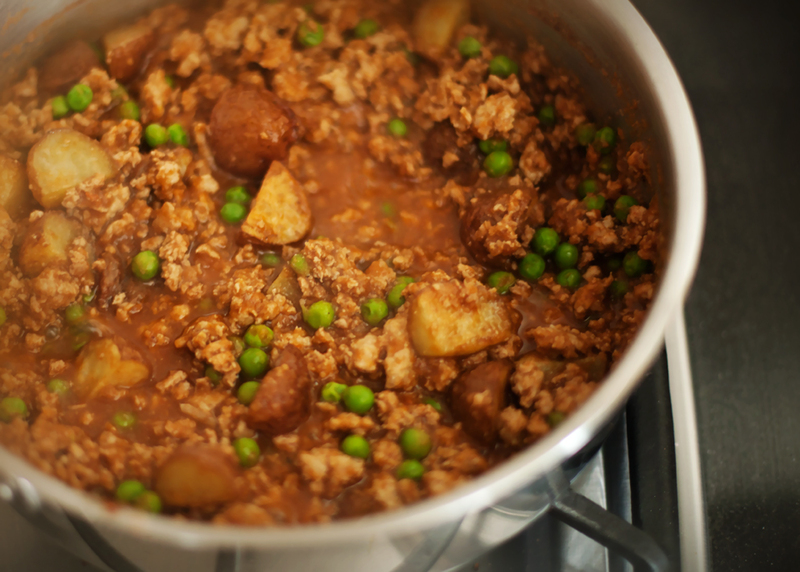 Chundo Jo Saak is a ground beef curry made with potatoes and peas. My hubby Brett calls it Indian shepherds pie. Ground beef can be quite fattening, so I substitute the beef with ground chicken to save some calories. 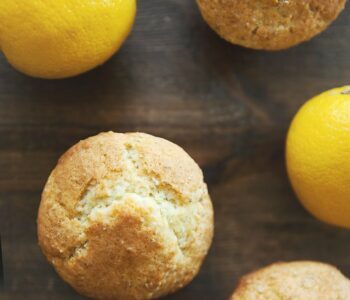 The end result still tastes awesome and I would definitely recommend this option if you’re watching your waist line (like I always am!). I really don’t like it when the potatoes get mushy and break up in the curry. An extra step that I do to prevent this is coating the potatoes in olive oil and baking them in the oven before adding them. The potatoes develop a skin to prevent them from breaking up and taste so much better this way. Peas are the other main ingredient in this dish. They are a great combination with the meat and potatoes. 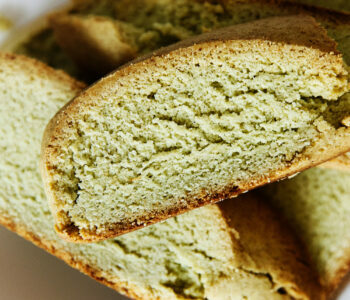 The peas make the meal healthier as well, love that!. 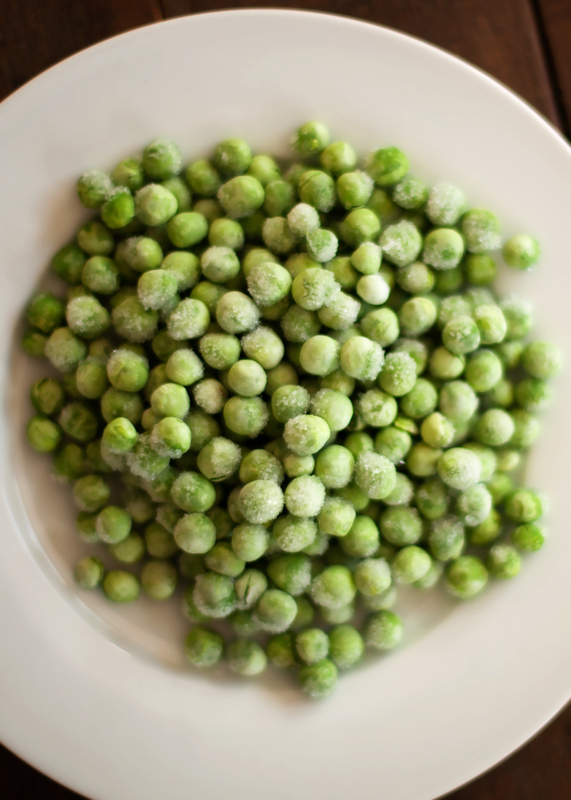 I use frozen peas to keep it simple. 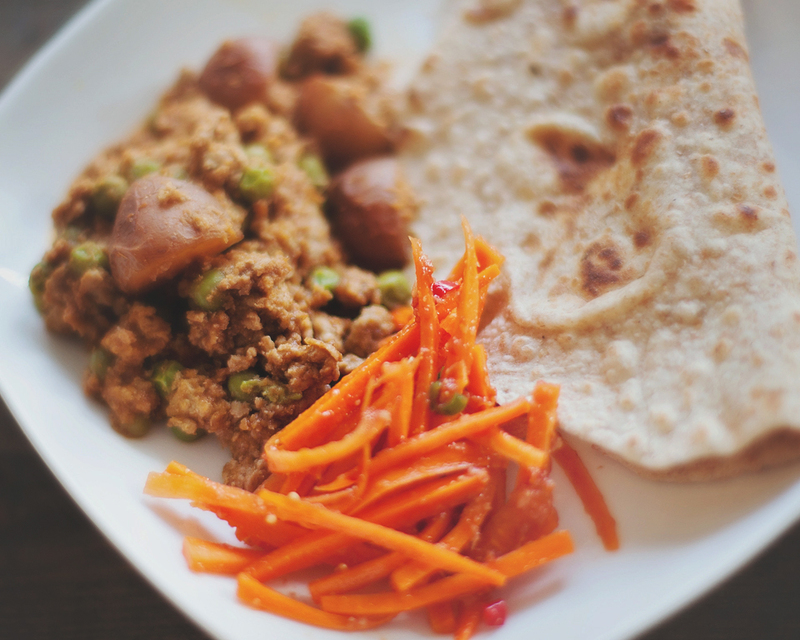 The photo below is what your curry should like after everything has been added and is in the final stages of cooking. You want to make sure that you cook it long enough that all of the flavours blend together. Chundo Jo Saak goes really well either rice or rotli and some yummy Gajar Jo Athano (Carrot Pickle) on the side. 1/2 Medium Red Onion Blended. Slice potatoes into 4 sections each and toss in olive oil. 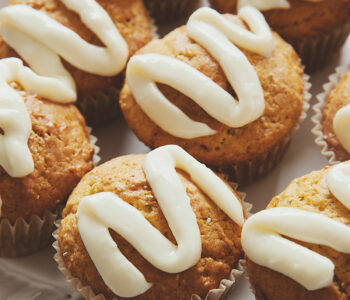 Place on an aluminum foil covered pan. 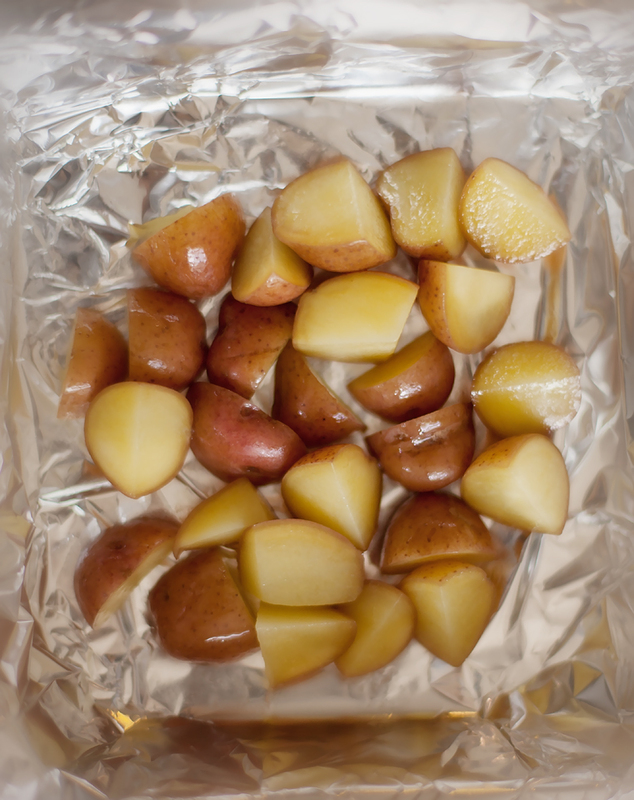 Cover the potatoes with foil and bake in the oven at 400 degrees F for 10 minutes. 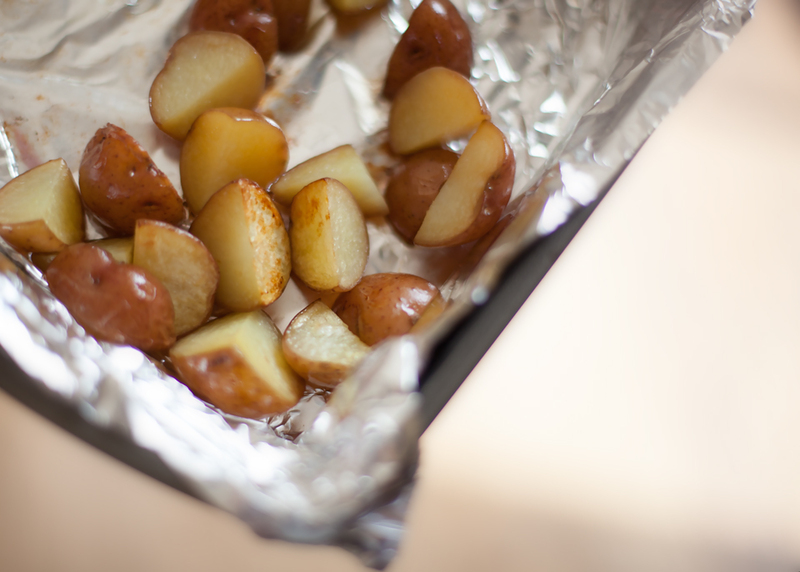 Remove the foil and bake for another 10 minutes. Flip the potatoes and bake for 10 more minutes. Set potatoes aside. In a large pot, cook the ground beef (chicken) until it is browned throughout. Remove from the pot, rinse with water and strain to remove excess fat. Set aside. On medium heat, melt a tsp of coconut oil in a large pot. Once the oil has melted add cloves, salt, garlic and ginger. Stir well and sauté for a minute. Add ground beef (chicken) and blended onion and stir. Cook for 2 minutes. Add crushed tomato, stir and simmer for 5 minutes. Add peas, water, garam masala, turmeric, cayenne pepper, ground cumin and ground coriander. Stir well and cook for 15-20 minutes partially covered. Add potatoes and lemon juice and cook for 5 more minutes. Serve with Rice or Rotli. Goes well with Gajar Jo Athano.